The low profile offered by the RS Series provides you with the ultimate solution to your indexing needs. If you seek an indexer that will allow you infinite positioning options, the RS series is the answer. Not only does the RS Series include Infinite positioning among its traits, but it offers high thrust load capacities as well - from 5000 kilograms (5.5 tons) all the way up to 9000 kilograms (nearly 10 tons). The high thrust load capacity is provided by an integral main bearing. 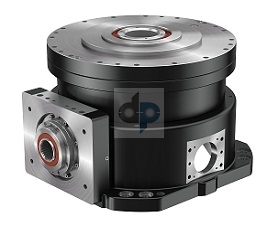 A precision gear box featuring Near Zero Backlash Technology assures consistent performance, with a backlash of 1 arc minute or less. The gear box also includes a right-angle configuration, so that the footprint remains small while keeping your motor in an easy-to-access location. An upgrade to the RS series doesn't require you to change from your existing servo motors - the RS Series is compatible with most common servos. Every indexer in the RS Series offers either a wall - or a floor-mount base and comes pre-greased to give you a quick installation. If your application requires an indexer with infinite positioning capability, the RS Series is for you.